Long standing rootsical bassmith King Yoof on Biological Beats... Now this is a partnership you can set your watch by. Providing, of course, you only ever check your watch when it's 'gully o'clock'. 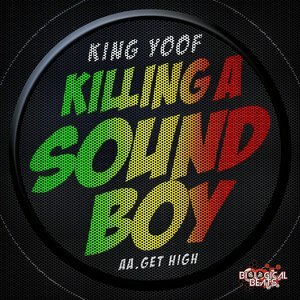 Which it certainly seems to be right now as both cuts crush it on an obese level; "Killing A Soundboy" bumps with a big belly bassline, skipping beats, stacks of space and a very cheeky sample on the breakdown. "Get High" is equally flabby in the low end area. Think DJ Die. Think Bristol rollers. Think about your local watch fixer who's fresh out of work because everyone's setting their timepiece by this release. Pure regicide.